Technology | Senkox Technologies Inc.
A lot of industrial assets need an effective distributed temperature monitoring system to detect early signs of fire or overheating over a large area and/or a long-distance range—for example: coal storage domes, fuel storage tanks, high temperature reaction vessels, cable trays, conveyors etc. The temperature sensors should be able to cover most monitored objects, and they are capable of detecting the highest threatening temperature (called “hot spot”) which has the potential to trigger a fire alarm in a specific area. The point type temperature sensors, such as thermocouples, thermistors, digital temperature sensor DS18B20 etc, are well known and widely used for temperature monitoring. These point type temperature sensors are linked together to monitor the distributed temperature in some applications. The point type sensors have precise temperature measurement and can detect temperature changes in localized areas. However, monitoring coverage depends upon the density and distribution of the point type sensors. In actual application, the number of the linked sensors is limited, leaving many areas between the sensors uncovered. Moreover, the wiring and installation are cumbersome, making it impossible to monitor large areas or long distances without great effort. Conventional linear heat sensors (LHS) were invented for distributed temperature monitoring as an alternative to the linked point type temperature sensors. 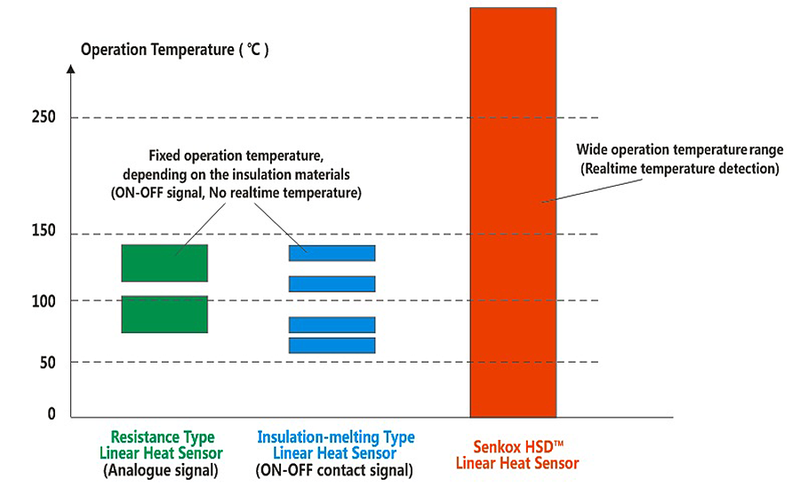 Two kinds of linear heat sensors have been commonly used for the last few decades. One of the commonly used linear heat sensors is the insulation-melting type linear heat sensor, which consists of a twisted pair of steel conductors insulated from each other by a polymer coating. The polymer becomes soft when the temperature reaches or exceeds its melting point, allowing the inner conductors to contact each other, producing an electric short condition. The insulation polymer material becomes soft only at its specific melting point; therefore, each sensor will operate only at a single, non-adjustable temperature. It is actually completely non-active until the temperature reaches the melting point (or above) of the insulation material. The other LHS from this generation is the Analog LHS, which has pairs of wires coated with a negative temperature coefficient material. When the temperature increases, the electrical resistance of the wires decrease; the lower the coefficient, the greater the decrease in electrical resistance. Since there is no polymer to melt, the sensors can be reused. Differences in temperature from day to night can cause inaccurate temperature measurements, so it is important for the user to keep this in mind when calibrating temperature parameters. Several new types of linear heat sensors were developed in the last decade, including modified linear heat sensors, fiber optic distributed temperature sensors (DTS) etc. These products have different features and applications, oftentimes vastly different than the types of environments of our expertise. According to our experience in field application, the most important features for distributed temperature measurement include real-time temperature measurement, easy installation and maintenance, rugged and durable structure and reliability without false alarm. Linear temperature sensors monitoring temperatures along sensor lines. Real-time measurement of temperature, capable of alarming at the very early stages of an abnormal rise in temperature. Capable of detecting sizes and locations of hot spots along linear sensors. Rugged structure for durable use: withstands high temperature, high pressure, abrasion, and is oil proof. Senkox HSD™ Linear Hot Spot Detection technologies are specifically suited to detect fire, or overheating, early and over large or long-distance areas, such as coal storage domes, fuel storage tanks, high temperature reaction vessels, cable trays, conveyors, tunnels and so on. For more information, please check out Applications.